Data is from the June 2017 Data & Marketing Association (DMA) and Demand Metric "DMA Response Rate Report 2017." 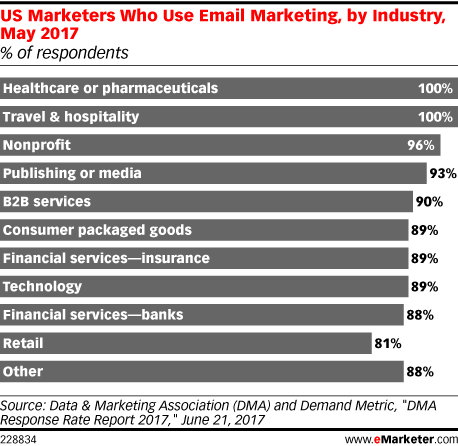 592 US marketers from various industries were surveyed online during February-May 2017. There were 252 complete responses and 340 partial responses. The survey was promoted to DMA members and members of the Demand Metric community. Respondents identified themselves as being part of an agency (14%), marketer (65%), supplier (9%) and other (12%) at companies with annual revenues of $10 million or less (43%), $11-$25 million (10%), $26-$100 million (16%), $101-$500 million (12%), $501 million-$1 billion (6%) and over $1 billion (13%). Marketers and suppliers were asked to provide representative campaign information, and agencies were asked to provide representative information from client campaigns.